These macarons turned into a bit of a nightmare, proof that even 10 months into this blog, things can still go wrong. I was only introduced to Ispahan recently when I read about it online. 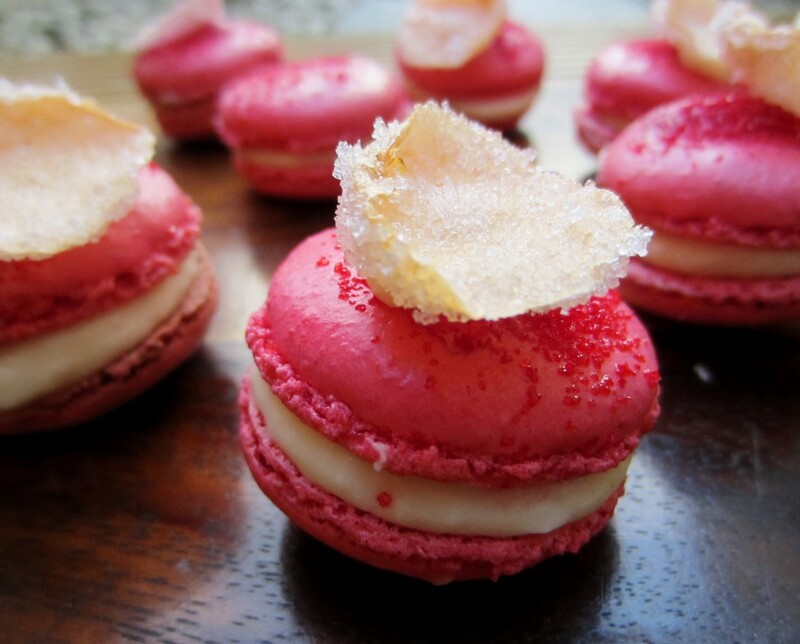 The name refers to a flavour combination of lychee, raspberry and rose, that is favoured by Patissier Pierre Herme. 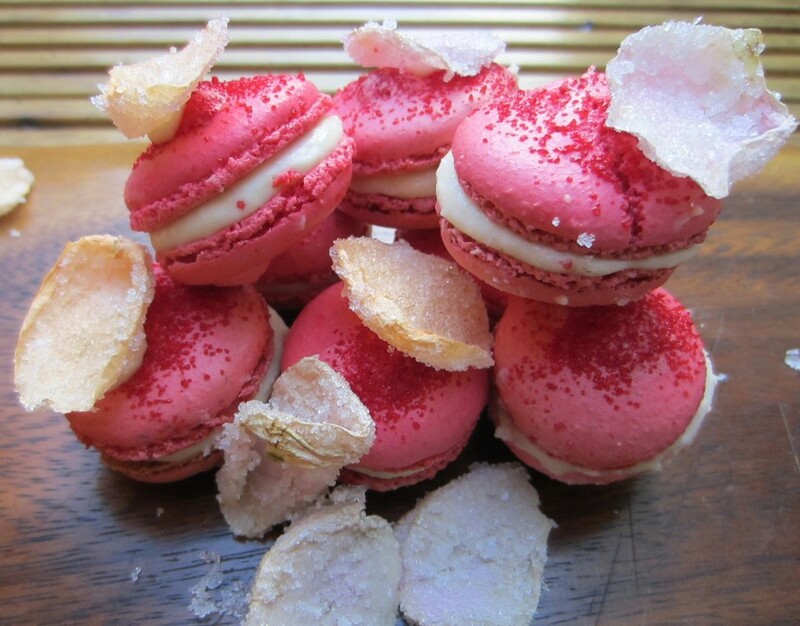 The recipe I used for these Ispahan Macarons is by Pierre Herme and it isn’t without its flaws. I have tweaked the recipe to the quantities that I think will work best, however I must add, that the finished recipe is not the exact recipe I used. So do please attempt this with caution and I would say, don’t make this the first macaron recipe you try! I’ve made macarons so many times before on this blog, you can find some useful information about how to make them in this post. The original recipe made 72 macarons, I really didn’t want anything like that many, so I halved the recipe making 36, which is still pretty substantial. 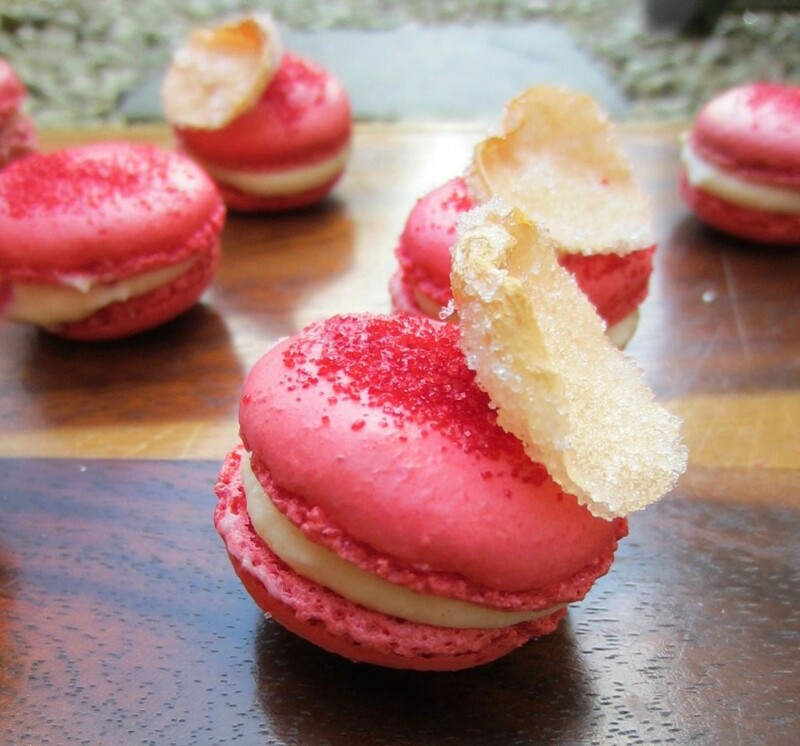 The macarons are decorated with a sugar dyed with food colouring, along with a crystallised rose petal. 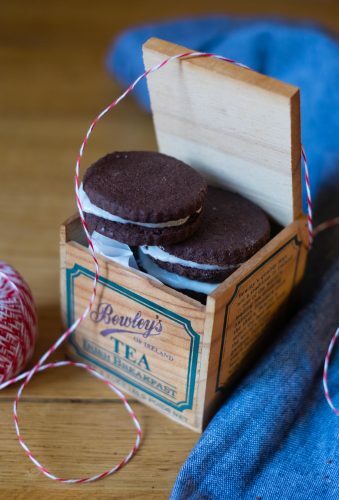 These decorations are very simple, but it is worth making them in advance of making the macarons as they can be stored for quite some time. To make the dyed sugar, combine granulated sugar with powdered food colouring and give it all a good stir. Don’t be worried if it looks quite pale/muted, when the sugar is sprinkled onto the wet shell of the macaron, the vibrancy comes out. 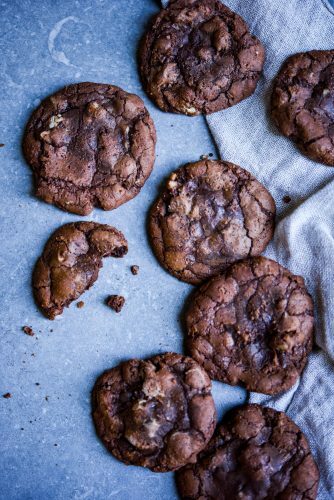 Alternatively, if you use a gel or liquid food colouring, you need to spread the sugar on a baking tray lined with greaseproof paper and bake the sugar for 30 minutes at 60°C to dry it out. The crystallised rose petals are also very easy to make, but you need to make these at least 24 hours before you need to use them. Take a rose(s) that hasn’t been sprayed and pull the petals you’d like to use from the rose. Brush the rose petals in egg white and coat them with granulated sugar and lay them on a sheet of greaseproof paper to air dry somewhere warm overnight or up to 24 hours. The sugar will last for months and the rose petals should be kept for around a month in an airtight jar. The macarons are made in the usual way, combining an Italian meringue with a mix of egg whites, ground almonds and icing sugar. 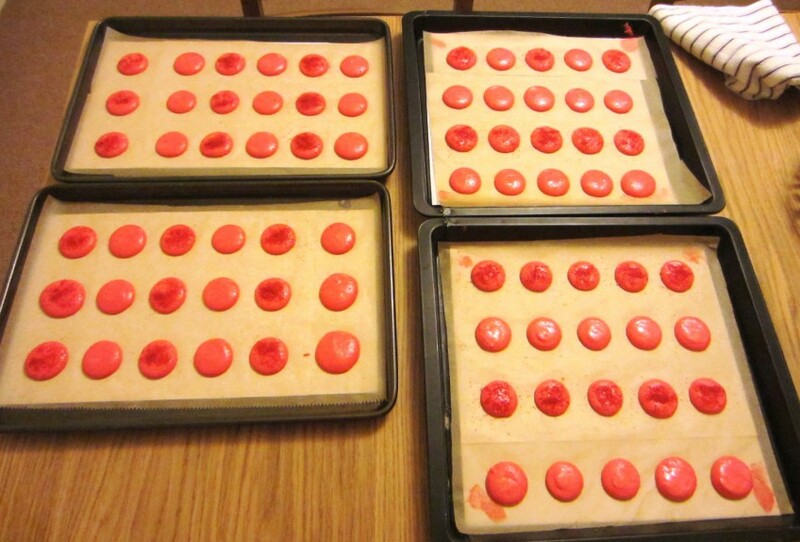 These are then piped onto baking sheets lined with greaseproof paper and a macaron template for piping. Half of the macarons are decorated with the dyed sugar, these will form the top part of the macarons. The recipe I used, called for the macarons to be left for 30 minutes prior to baking to form a crust. Then when the macarons are put in the oven there is an instruction to open and close the oven door quickly, twice during cooking. I have no idea what opening the oven is meant to do, but my macarons didn’t turn out any better as a result of doing this, so I wont be bothering with this again. 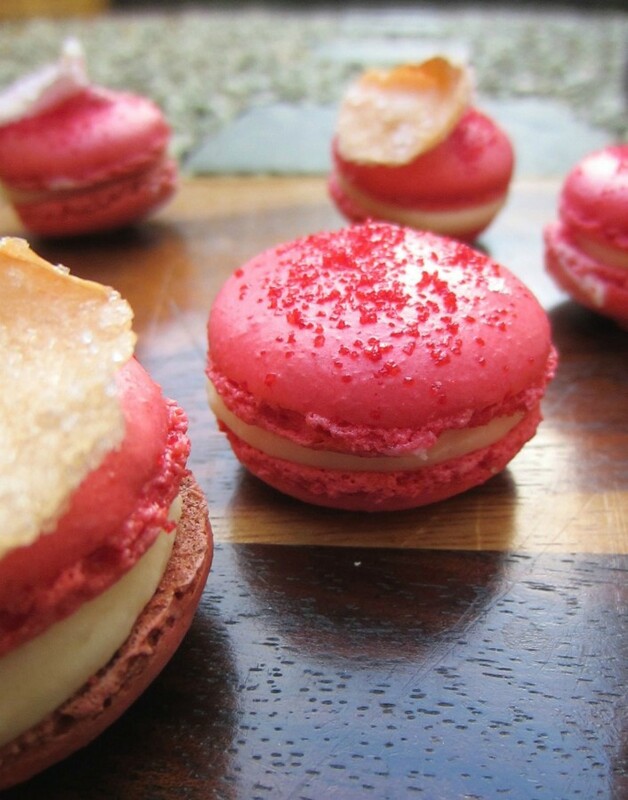 The filling for these macarons is really where the Ispahan element is contained. There is a lychee and rose, white chocolate ganache along with a cube of raspberry jelly in the centre. The jelly is a mix of raspberries, gelatine and sugar, the sugar is in quite a low quantity though and the tartness of the jelly really cuts through the sweetness of the ganache and the macaron. I used frozen raspberries to make this jelly and it’s a much cheaper way of buying them, also because I used frozen fruits, it helped the jelly to set very quickly. Once the jelly is set, it’s cut into squares of 1.5cm and then placed in the freezer. The ganache is made by pureeing a can of lychees, sifting them and then heating the puree with some cream, before pouring this over the white chocolate to melt it and adding some rose extract. My ganache was very runny and nothing was helping it to set, I ended up having to add double the quantity of white chocolate and some more rose extract to get this to the right consistency. The ganache is left to cool in the fridge, when the macarons are ready to be assembled, a blob of ganache is piped onto the base of the macaron, a piece of raspberry jelly is pressed into the middle and then topped with another blob of ganache and the sugar sprinkled macaron top. At this point you can add another small blob of ganache to the top of the macaron and use this as glue to secure a crystallised rose petal. 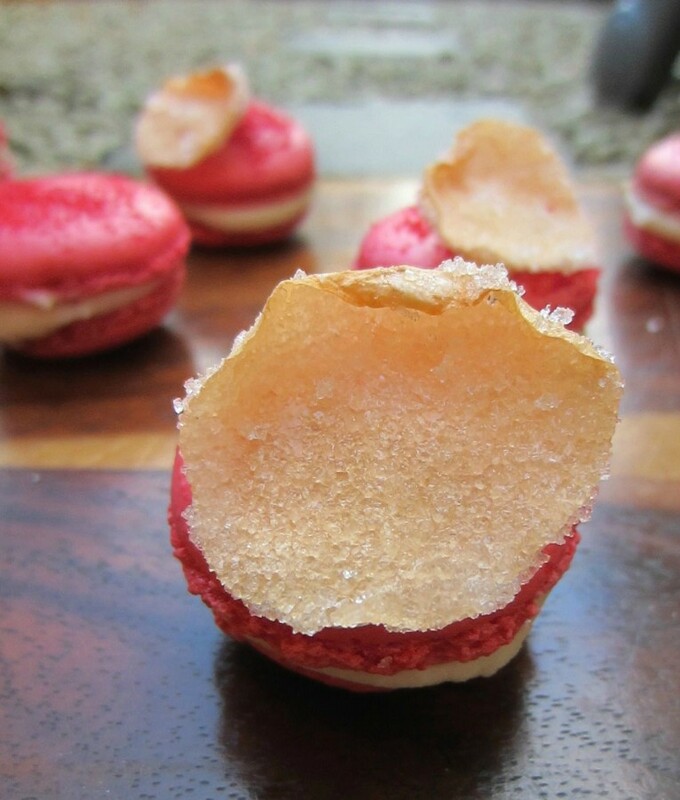 This is a recipe for Ispahan Macarons which is a combination of rose, lychee and raspberry. This recipe has been tweaked from the original as I had issues with the quantities in the original recipe. Soak the gelatine leaves for 15 minutes in cold water to soften. Using a hand blender, blend the raspberries and sugar to a purée. Strain the purée to remove the pips. Heat a quarter of the purée to 45ºC. Drain and dry the gelatine and add to the hot purée. Stir and add the rest of the raspberry purée. Pour it into a gratin dish lined with cling film to a depth of 4mm. Allow to cool for 1 hour at room temperature then put the dish in the freezer for 2 hours. Turn out the jelly and cut it into 1.5cm squares. 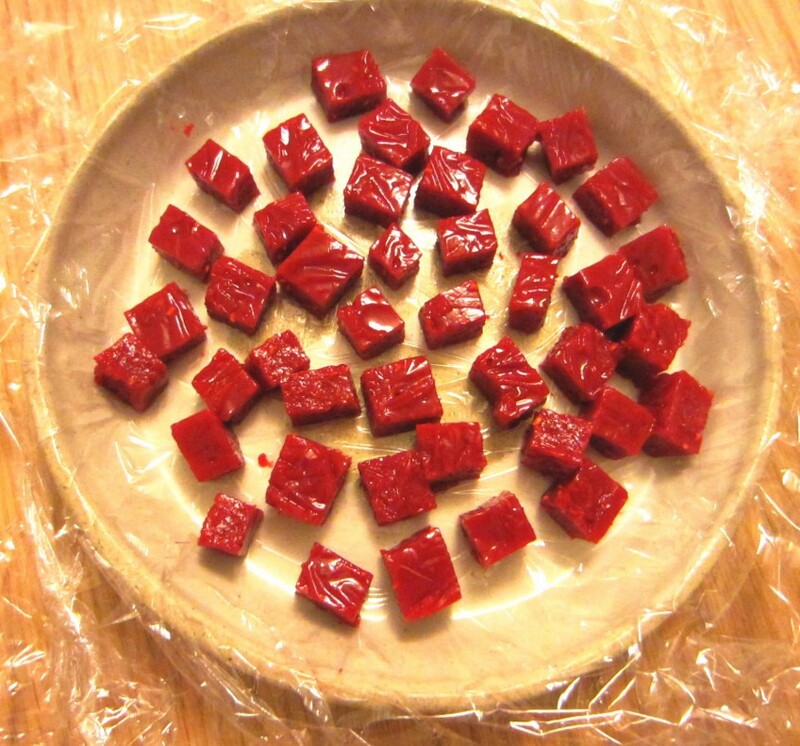 Return the jelly squares to the freezer. Preheat the oven to 60 ºC. Mix the sugar with a few drops of food colouring and stir it with a spoon. Spread out the coloured sugar on a baking tray. Put the tray in the oven and dry the sugar for 30 minutes. Alternatively if you use powdered food colouring you don't need to dry the sugar out in the oven. Grind the icing sugar and ground almonds in a food processor and sift together the icing sugar and ground almonds into a large bowl. Stir the food colouring into the first portion of egg whites and pour them over the mixture of icing sugar and ground almonds, but do not stir. Bring the water and sugar to boil at 118 ºC. Start whisking the second portion of egg whites to soft peaks. When the sugar reaches 118ºC, pour it over the egg whites. Whisk and allow the meringue to cool down to 50 ºC, then fold it into the almond-icing sugar mixture. Spoon the batter into a piping bag fitted with a plain nozzle. Pipe rounds of batter about 3.5 cm in diameter, spacing them 2 cm apart on baking trays lined with baking parchment. Rap the baking trays on the work surface covered with a kitchen cloth. Sprinkle every other row with pinches of coloured sugar or ruby glitter. Leave the shells to stand for at least 30 minutes until they form a skin. Preheat the fan oven to 180 ºC then put the trays in the oven. Bake for 12 minutes, leave to cool completely before removing the macarons from the paper. Drain the lychees. Blend then strain them to obtain a fine purée. You will need 100g purée. Bring the cream and lychee purée to the boil. Pour it over the chocolate a little at a time until you get the desired consistency (quite thick), not all of the puree may be needed. Add the rose essence and stir. Pour the ganache into a gratin dish and press cling film over the surface of the ganache. Set aside in the fridge for the ganache to thicken. Spoon the ganache into a piping bag fitted with a plain nozzle. Pipe a mound of ganache on to half the shells. Lightly press a square of frozen jelly into the centre and finish with a dot of ganache. Top with the remaining shells. Store the macarons for 24 hours in the fridge and bring back out at the point of serving. Have you given any recipes a try that just don’t seem right? 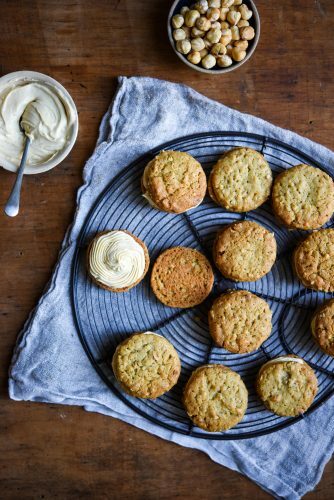 Have you had enough ingredients leftover to make twice the quantity of what you were baking? Alternatively, which are your baking bibles, are there any chefs that you always trust? I know this is an old post, but I happened to see it today, macaron-obsessed that I am. I had issues with Herme’s recipe for macarons, basically I found that he likes to bake them in a much hotter oven than I do, and I ruined a batch of pistachio macs because of that, following his recipe to a T.
I had this one in my files to try for a long time, although I won’t bother making the rose petal decorations, just the dyed sugar, I think. Yes I know what you mean, I personally always prefer to use the italian meringue method as I find it to be more stable and the recipe I use for most of my macarons in a Christophe Felder recipe. I did have good results with this Pierre Herme recipe, but it makes a large quantity of macarons. If you make them, let me know how you get on. I assume the opening of the oven is to let out some of the steam and dehumidify the oven, which can help the shell crust to form. Hi David, yes I’m sure you’re right. Back in 2014 when I wrote that post I was very much a beginner and I really had no understanding of how steam was used in professional kitchens. The Pierre Herme recipe was on a mass scale and so a lot of the instructions I think applied to batch cooking. I have never bothered with letting the steam out of the oven when making macarons or letting a skin form – but that is generally because I use the Italian meringue method. 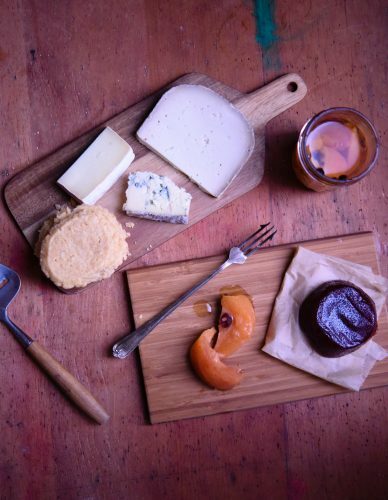 Thanks for commenting and reminding of an old post – hope you enjoy the blog. Yours look great too Dean. They taste delicious don’t they? You’ve made lots of great things too. Thanks for commenting. I love the color on these. Like the World Cup macarons you made, the colors are so fun. Is October is Breast Cancer Awareness Month in England too? Pink being the supportive color, I could see a lot of bakeries selling these. I think that might be October, but I’m not sure, pink is definitely the colour to mark it here too. I love the colours too, it’s one of the most fun parts.